Sitting alone one night, contemplating my lifetime yearned for trip to Africa, and realising my dream was about to come true, I remembered that while we would be on Safari, it would mark the 10th year of our wedding. My thoughts starting racing to how I could make this a memorable moment in our dream holiday. I quickly contacted my travel agency and proposed the idea. They in turn contacted Kumuka in Nairobi, who in turn contacted the team at Intrepids Siana Springs Tented Camp where we were staying, and a simple thought turned into an unimaginable story! On the 19th September 2008, we embarked on a journey that will rival stories to tell through many generations. The wonderful team at Siana Springs had organised a Masai Ceremony to celebrate our 10th Anniversary. On the eve of the ceremony, my husband was to meet me at a wonderful ceremonial campsite called "Sundowner Camp", a self-explanatory name as it turned out! I, and our 8 year old son, had the luxury of being escorted there via Safari bus, but my husband was to trek to the site with the 2 masai elders and another wonderful warrior/interperator "JJ". We were all quite anxious as, although we had organised this ceremony, we still had no idea what to expect! On arriving at the ceremonial site, I was dressed by my masai matron of honour in a beautifully hand beaded skirt, top and cape, whilst my young son was cloaked in a traditional masai outfit of tunic and cape, we were both given traditional masaai shoes, made completely out of recycled tyre rubber, which we found suprisingly comfortable! 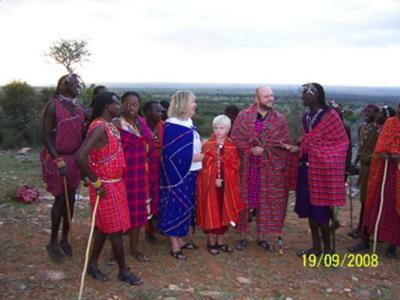 At the same time, my husband was also fitted in traditional masai attire, and was being escorted to the site. We were both kept from seeing each other by a blanket draped over two bushes, through which we each had to enter the ceremonial site. As we passed through the "altar", we were blessed by 2 elders in the traditional verse used for masaai weddings. Having been blessed, we were both led to each other, with our young son participating in the proceedings, and we somehow managed to blurt out vows of undying love and thankfulness for the wonderful years we have had and anticipated for the future. It was so overwhelming I really can't remember what was said, and thank the wonderful team that accompanied us from the resort for filming and photographing the events for prosperity! Thinking this was the end of the ceremony, we were starting to relax when out of the bushes we were thronged with a mock attack by a group of masaai warriors, in full dress and brandishing spears and very loud chants! Although we couldn't understand what was being said, the tribal voices echoed around us and we felt the meaning all the same. With the sun now setting in the hinterland and casting a golden glow over our ceremonial site, we were further surprised with more ceremonial blessings. All three of us were again taken by the elders and blessed with masai names, decided by the attending warriors. My son was presented with a "leadership stick", hand crafted with beautiful beading along the length of the shaft, whilst my husband received an elders walking stick, similarly beaded along the length of the wood. The resort kitchen had supplied a magnificent wedding cake fully decorated with intricately detailed icing, which we were to cut and share amongst all partipants. A table of refreshments was provided, with any kind of beverage we wanted, another table set up with warming trays of finger-food, and the feast was to begin! The masai members delighted us with their beautiful tribal voices & music and of course the well known dancing and jumping, and as my husband and son were now officially accepted into their clan, they too participated in the jumping tradition. The ladies apparently don't jump - something I must say I didn't regret!!! The sun was now down, and it was quite dark, and although there was no pressure to end the ceremony, we felt it would be prudent to continue our festivities back at the resort camp, so reluctantly agreed to leave. At this stage it was assumed we would return to the camp via our safari bus, but as often happens with the bravado of a few alchoholic drinks, we decided to forgo the safety of the bus, and travel by foot, through the wilderness and back to camp. This was in itself a magical experience, with the warriors filling the night with their haunting and beautiful voices, chanting their magical tunes whilst surrounding us to protect us from any unseen predators lurking in the surrounds, whilst escorting us back to the resort camp. A beautiful fire was burning on our arrival, and although not needed for warmth on such a barmy night, the atmosphere was perfect to finish such an amazing experience. We spent another few hours around the fire listening to more of the masai's beautiful tunes, until finally, our youngest warrior could stand no more, and had to be tucked in to bed! I cannot begin to express the incredible emotions and unforgetable memories we will have with us always from this most amazing and magical journey which we were invited to share with these beautiful people. Suffice it to say, it really will be a story that can be passed from generation to generation to come. Thank you for sharing your wonderful experience! It brightened my day as I read of the many ways you were honored. It is always a joy for me to hear of other cultures who share and how we as Americans appreciate their sincerity and genuine love. May you have many more years of happiness and joy as you share these memories and others you will create together. What a wonderful experience you all had. I'm jealous....Slowly going through your adventures. Wow!!! How cool!!! Sounds too magical to be true!!! You never cease to surprise me Brigitta - the things you manage to pull off!! Very happy for you all that you had such a ball and can't wait to catch up soon to see photos of the rest of the trip!! Hi Brigitte, thanks for sharing this story. What an impressive experience this must have been for you! I could feel your enthousiasm when I read it. Five stars for your story! I hope you enjoy the Maasai music I emailed you about. Say hi to your family for me.